August 19, 2014, 4:15 p.m.
On August 9th Michael Brown, an unarmed 18-year-old black teenager, was shot six times by a white police officer. Brown was shot in the town of Ferguson, Missouri, a predominantly black town governed by a white local government and riven by racial tension. The next day a community protest and vigil turned violent, leading to incidents of looting. Virtually every night since August 10th the streets of Ferguson have witnessed violence, with the police facing national criticism for excessive use of force. The shooting and subsequent violence has attracted massive media attention at a time when issues surrounding the police and race are in the spotlight. The latest research from YouGov shows that the American public is split on whether or the shooting of Michael Brown was an isolated incident, or if it is part of the broader pattern of how police treat black men. 35% say that it is an isolated incident, while 39% say that it is part of a broader pattern. White Americans narrowly tend to say, however, that it was an isolated incident (40%) rather than part of a broader pattern (35%). Black Americans, however, overwhelmingly say that it is part of a broader pattern (76%). 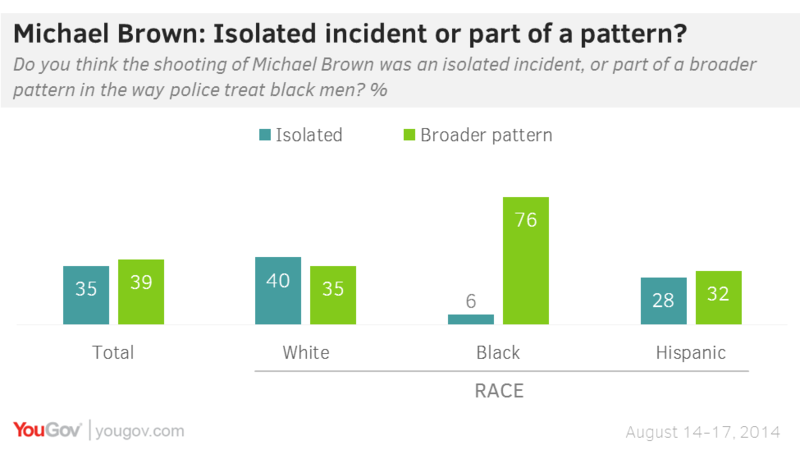 Only 6% of black Americans think that the shooting of Michael Brown was an isolated incident. 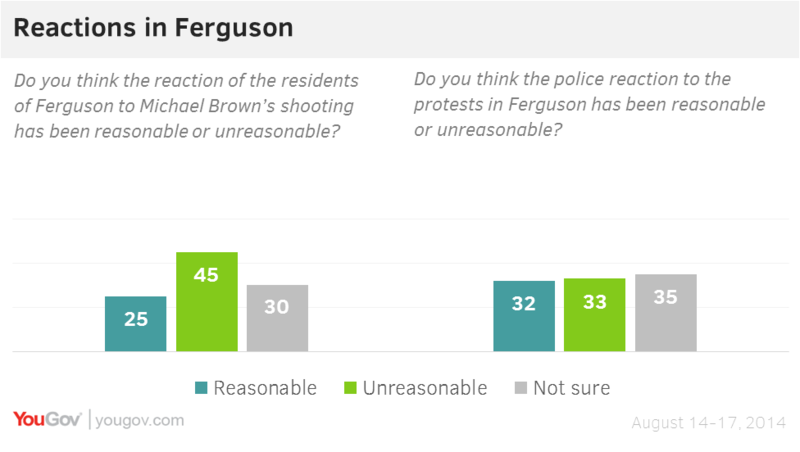 Overall, public opinion tends to think that the reaction of Ferguson residents to the shooting was unreasonable (45%) rather than reasonable (25%). Attitudes about whether the police reaction was reasonable or not are split, with a third saying the police reaction was reasonable and a third saying it was unreasonable. This even split conceals significant partisan disagreement, however, particularly when it comes to whether or not the police in Ferguson have behaved reasonably. 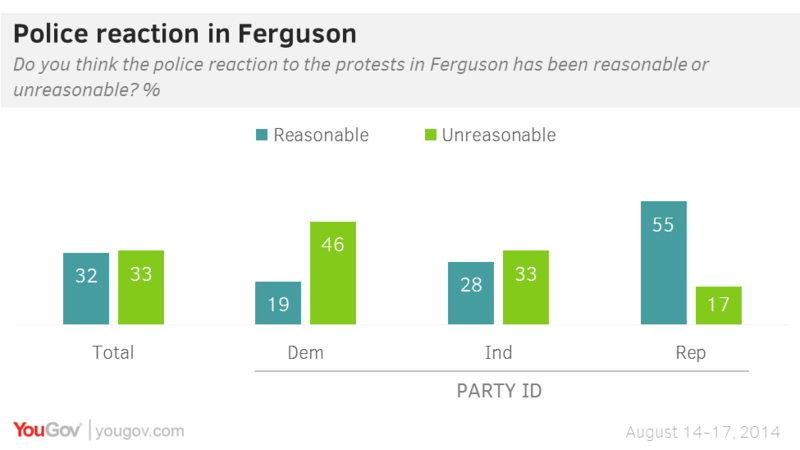 Democrats tend to say that the police acted unreasonably (46%) rather than reasonable (19%). Independents also narrowly tend to say that the police were unreasonable (33% to 28%). Most Republicans, however, think that the police reaction was reasonable (55%), with only 17% of Republicans saying that the police acted unreasonably. Faith in whether or not the officer who shot Michael Brown will face appropriate punishment is low among Democrats and black Americans. 46% of Democrats, and 49% of blacks, think that he will be punished too leniently, something only 28% of whites and 10% of Republicans agree with. More than a week after the first unrest, the Governor of Missouri, Jay Nixon, announced that the National Guard would be deployed on the streets after police officers came under attack from petrol bombs and gunfire on Sunday night.